We made our first sales! We sold our first items this week! A wee ceramic fox, and the kama sutra from the last post! 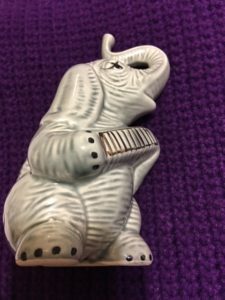 Today I give you a ceramic, mid-century elephant playing the squeeze box. Honestly, how can looking at that not bring immense joy? Keep up with our shop here! Clink for linky.